The man who got the “Etch-a-Sketch” answer out of Mitt Romney’s spokesman, the man who changed the political news cycle for 48 hours, the man who caused a 148 percent spike in a toy company’s stock, was not a political reporter. John Fugelsang happened to be a guest on CNN’s Starting Point, and Romney guru Eric Ferhnstrom happened to draw the straw that put him on that show. Some reporters, like Yahoo! News’s Holly Bailey, had put Ferhnstrom on the record before talking about a post-primary reset. 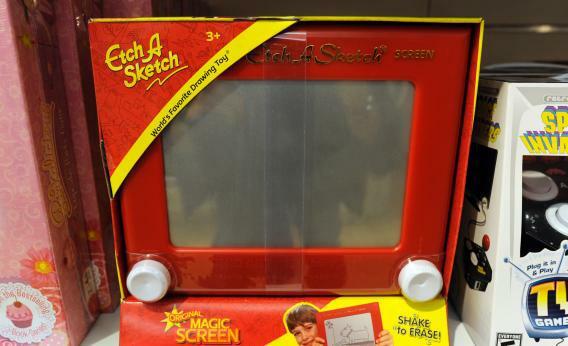 But the Etch-a-Sketch answer – ah, there was an analogy to remember. I talked to Fugelsang briefly over e-mail; this transcript is lightly edited, mostly to make my easy questions sound more astute. Slate: When he gave you that answer, did you immediately realize you’d tripped him up? Fugelsang: I knew how shocking his answer was immediately, but there were two mitigating factors. One: I knew I couldn’t really ask a follow-up question. I was just a guest on CNN and they were very short on time. Two: I’ve gotten so accustomed to outrageous claims from the Romney campaign going unchecked that I honestly didn’t think most of the media would pick up on it. I didn’t realize anyone had noticed until I was riding home an hour later and checked Twitter. Slate: He’d been asked this question many times. Were you actually surprised at the answer? Fugelsang: I was very surprised. One would think the campaign’s communications director, of all people, would have a prepared answer to that question. As a comedian, I’ve got to try twice as hard to be fair when asking a question of a legitimate news figure. I thought it was a fair question and he gave an admirably honest answer. Hence the irony that the Romney campaign is finally catching it because someone told the truth. Slate: But has the subsequent Etch-a-Sketch mania been fair? It’s all we talked about for 36 hours. Fugelsang: I do feel that the subsequent furor has been fair. Anyone who’s ever lost a loved one to breast cancer should be outraged that a guy who once donated thousands to Planned Parenthood is now boasting that he’s going to destroy it. After this short exchange, Fugelsang continued his musing on Twitter.